When you glance at an analog clock, have you ever noticed that the second hand seems to pause right as you started looking? Either your face is ugly enough to stop a clock, as the old saying goes, or it's the work of the Stopped Clock Illusion. 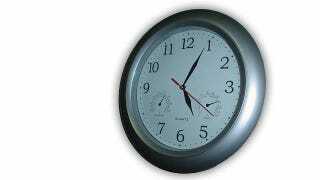 When you glance at a clock, in a hospital, or at school, or at some other institution that still uses analog clocks, the second hand seemed to lag just for a second before resuming its normal pace around the clock. This is a demonstration of the fact that our brain is as much a part of how we perceive time as the reality of time itself. Have you ever wondered why, as your eyes dart from one place to another, the world doesn't go on and off like a strobe light? Or blur wildly like film of the countryside from a moving car? You are abruptly cutting off all the input to your eyes, making them swivel around, refocusing on whatever the new thing is, and you don't even really notice a skip between the two sights. We can glance away and glance back at something without ever knowing we're doing it. Researchers think that we don't notice these skips because the brain lets us experience vision as one continuous movement; it fills in these skips in vision the way it fills in a blind spot. Sometimes it does this by making us believe that certain moments lasted longer than they did. We don't notice this until we look at something that makes a regular movement with which we are utterly familiar. We know what a "second" looks like, and we know when one has been drawn out. We just didn't know why until now.